Even by Hollywood standards, the Oscars this year were dramatic to say the least. Although the events that transpired will provide enough small-talk fodder to last the month, all the jokes, the gossip, and the pointing of fingers have really detracted from what is the greatest part of the awards season: the fashion. It is (or should be) a truth universally acknowledged that, no matter how wonderful a snarky tweet may seem, it could never compare to the beauty of one perfectly draped piece of satin. The following celebrities in their fabulous frocks attest to this simple truth. For this, they deserve awards of their own (even if these titles don’t come with a gold statuette). Although there have been some slight changes and deviations along the way, the standards for suits and tuxes have been remarkably consistent over the past few decades. Faced with this relatively immutable set of guidelines, many often find it difficult to take a risk and push outside the bubble of black jackets and black ties. 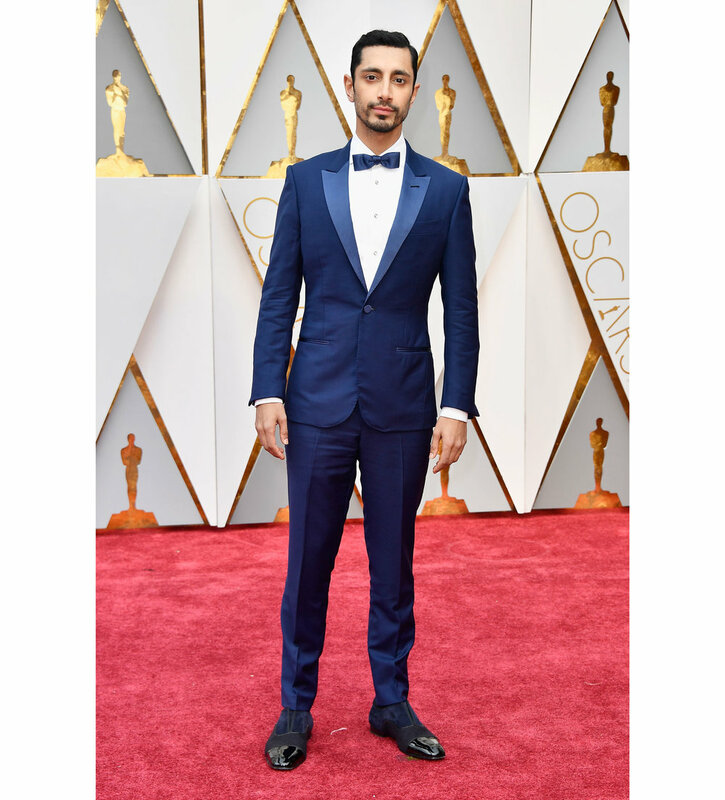 That is why it is so refreshing to see Riz Ahmed’s striking, cobalt ensemble. The deep blue not only draws attention, but a touch of warmth to his elegant demeanor. Western standards of dress permeate many aspects of our interpretation of style today, whether we like to admit it or not, and Anita Patel’s decision to wear a sari on the red carpet gave us another facet in the idea of expression through clothing. Her black and jeweled sari had both gold and silver accents and was topped off with dangly jeweled earrings. While obviously a very different style of garment, Anita Patel’s ensemble blended seamlessly with the other beautiful gowns that night. Patel in her sari complimented her son’s Western-styled white tuxedo very well, both serving as a physical representation of two different cultures and the relativity of beauty through fashion. For most 16-year-olds (or maybe just for this 16-year-old), dressing up means putting on your brand new crop top and maybe even wearing eyeliner. For Auli’i Cravalho, it means utter and complete devotion to an aesthetic. Every part of the dress: from the scalloped edge of the train, to the shine of the silver overlay, to the hint of white tulle underneath works perfectly together. Her metallic clutch adds just the right amount of substance and edge to her otherwise mellifluous ensemble. Her bracelet drapes elegantly over her hand. Her hair falls in perfect waves, framing the delicate, shimmering stripes that travel from her neckline to her waist. David Oyelowo is a well-known actor in is native Britain as well as Nigeria, and his rise in the American film industry brings along his international sensibilities. His tailored white tuxedo jacket with embossed detailing deserves serious execution points in terms of an appropriate use of flashiness, because the white jacket is an extremely hard look to pull off without looking like a host at a restaurant on a cruise ship. However, Oyelowo executes this ensemble with an English charm that we could only dream of having, somehow giving us a sense of nostalgia for a time period during which none of us were even alive. Let us all have a moment of silence for the bejewelled decadence that is Janelle Monae’s outfit. I want to start with the structure of this dress, because although I personally found it breathtaking, it has been met with mixed reviews. Most critics love the figure-hugging component of the dress but say that the black tulle resting on her hips is superfluous, but I have to argue otherwise. While certainly a clear departure from uniform silhouette that we have all grown comfortable with, Monae’s dress allowed us to experience the Cinderella-fairy godmother sentiments that we feel when we watch celebrities walk the red carpet. The dichotomy between the harsher metallic jewel-encrusted accents and the softer of the tulle and cut of the dress plays with texture, color, and luster in a way that draws attention to every intricacy of this dress, in case you’ve looked over something. Monae has never been one to follow traditional rules of what one can and cannot wear, and we should be grateful for the beautiful pieces that result from her innate stylistic independence. When looking at Karlie Kloss’ ensemble, “stunning” is the only word that comes to mind. Her fitted, pure-white, sheath dress is true embodiment of the “less is more” philosophy. Her one-shoulder cape is an unexpected twist, but a wonderful surprise. And what better accessory is there than a diamond choker to top off her modern-Greek Goddess garb. With the Oscars being such a formal event, it often dissuades its attendees from wearing anything but floor-length dresses. In an act of quiet rebellion, Kerri Higuchi walked the red carpet in a white tea dress with stitched floral accents. What is truly impressive about this gown is the front hem of the dress develops into the train with an almost geometric flourish, rippling down until the back of her dress just kisses the carpet. Higuchi pinned most of her hair up save a few strands to frame her face and polished her look with a rosy eyeshadow, and all in all channelled the ever-so-gracious hostess of a West Hollywood afternoon tea. Leslie Mann’s voluminous, yellow gown invokes images of princesses, castles, and magic. It enchants with its warm, sunshine hue, and dazzles with its layers of interlocking bows. If the dress for Disney’s new Beauty and the Beast movie has yet to be acquired, they need not look any further for a perfect choice. Feathers have to be one of the hardest things to wear on a formal gown. Wear too few and you might as well have worn none. Wear too many and you will begin to look like the very bird whose plumage you have plucked. Octavia Spencer found the perfect balance for her stunning silvery-gray gown. The feathers snake their way in tendrils up the sides of her skirt, providing a delicate balance to the harder lines in the bodice of the dress. The feathers’ soft, dove-gray hue further adds to the magic, combining with the airy tulle to create a gown with ethereal beauty. While I have to concede that this dress is not the best color for Emma Stone’s complexion, I loved her execution of fringe, which has surely become this award season’s newest style trend. The exquisite beading hints at a style aimed toward The Gilded Age, and the abrupt tiering of the fringe contributes to the illusion of longer legs and a shorter torso. Her matching 1920s-inspired hair and makeup did not go unnoticed either. The only pitfall of this look, however, is that a picture cannot fully capture the light play and the dimensions that the fringed bottom adds to her look. We all know Taraji P. Henson as a powerhouse actress who never misses an opportunity to tell us what she’s really thinking. She definitely does not prefer to leave this trait out of her fashion sense, because Taraji did not come to play games, y’all. Her homage to the Old Hollywood starlet took form in a low-cut, figure-hugging dress, and while the high slit and the plunging cleavage screamed modernity, the black velvet along with the classical silhouette gave us a taste of what it must have been like at the height of classic red carpet fashion. Her ensemble was coupled with a large jeweled necklace and simple black clutch and gave us an aura of effortless perfection that we honestly didn't know could ever be achieved. Topping the look off with a smokey eye and her always-immaculate brows, Taraji gave us mere mortals a look that we will not be forgetting anytime soon.